The pain in my stomach finally started to subside after midnight and I was able to get a couple hours of rest. I made my way back up to the trail and resumed my walk on the sliver of dirt that had been cut through the evergreen trees. 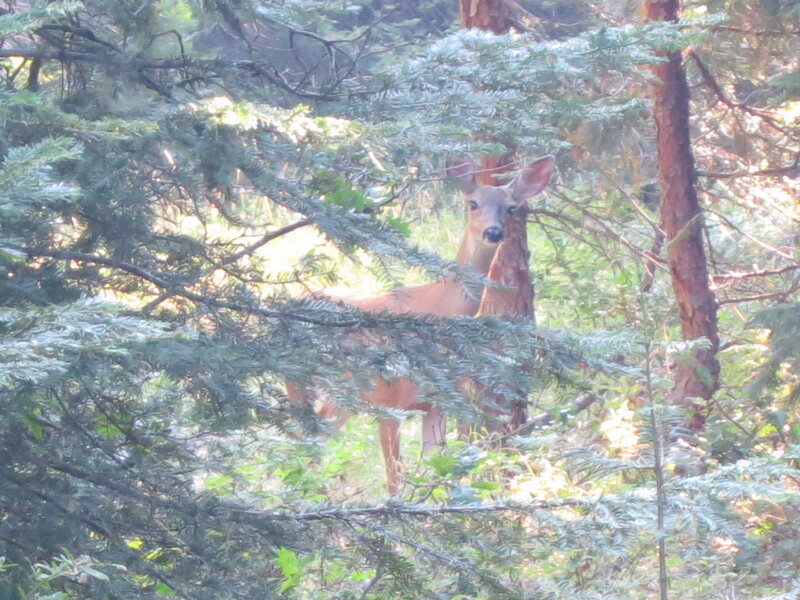 Before long, I came across two cute deer who were not immediately frightened off. After my first couple of miles, when I needed to take my first pack break along the edge of the trail, Veggie approached. He, Ole, and Track Meat had gone into the town of Ashland and then attempted to get back on the trail in the evening. At the trailhead, they ran into Legend and Viking, who had been drinking, and was now in the mood to go dancing. He convinced Ole and Track Meat to head back into town to go clubbing. Veggie did not want to go and carried all three of their packs a little way up the trail to a camping spot. They returned in the early morning hours and hadn’t woken up by the time Veggie started hiking. As he relayed the story, a crazy squirrel kept running towards us without fear! It kept scaring me and we had to continually shoo it away! In a couple more miles, I found Veggie and another hiker sitting around chatting. We were now in a very dry stretch of trail, without much shade. I hadn’t noticed the faucet nearby until I asked where the water was. Apparently, a big group of hikers had camped here last night and there was an unusually high level of animal activity, as well, including a bear! I listened to the stories from the guy I didn’t know as I sat on a rock, filtering my water. He talked about some crazy birds in New Zealand (or Australia?) that would dive bomb people and peck their heads! This guy had camped here last night as well and had spent the morning journalling. Both of them decided to carry very little water, banking on a source not far ahead. A little after noon, I ran into a hiker heading south. I had met the first southbounder of the year, Bobcat, on the day I hiked into Ashland. He was very skinny and it was easy to tell that he was a thru-hiker. 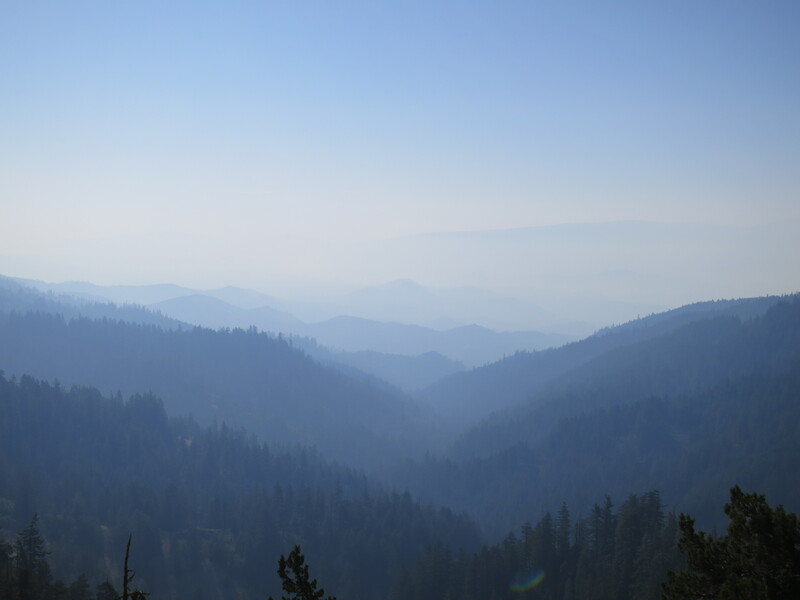 He was also very calm and polite and told me about all the smoke in Ashland from the forest fires. Fortunately, it seemed to have started clearing. 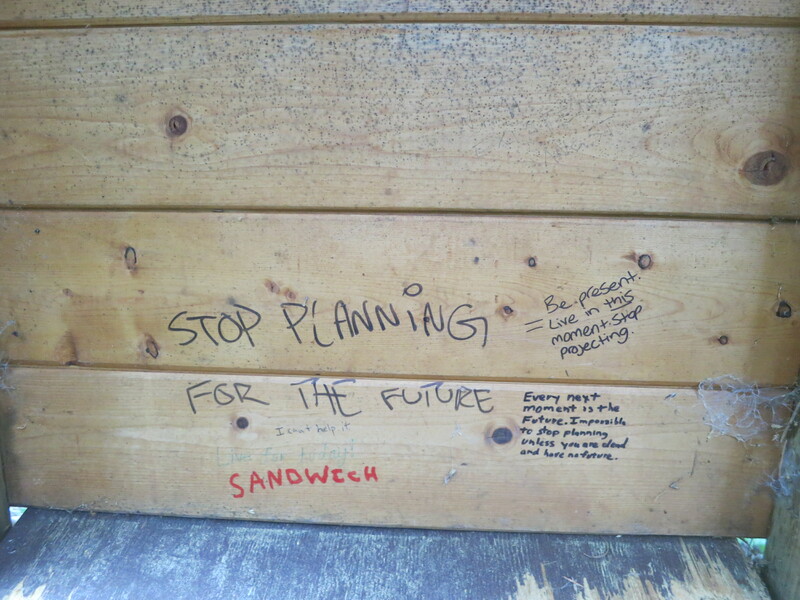 I asked the guy sitting on the log on the side of the trail if he was also a southbounder. He said his name was Forrest Man and I asked him what Washington was like, as I had asked Bobcat. I was worried about the tough terrain and my ability to hike 25 miles a day, which I would need to do in order to finish the trail by the 17th of September! They both talked about how much snow there was and how extraordinarily slow going it was for the first 200 miles. Forrest Man decided to skip 200 miles of the trail because of the conditions. He told me about spotting a dry branch in the middle of the several feet of snow he was walking on and stepped on it for a break. An entire tree sprung out of the snow when he did so! He also talked about how lonely it was. He said he enjoyed talking to all of the northbounders he met now. I asked him if that was taking up a lot of his time, to which he answered that he has now reduced his miles in order to chat. He didn’t seem to want to stop the conversation with me, so I had to slowly pull myself away. I had a lot of miles planned for today and needed to get a move on it! Before I left, he mentioned that I had a huge dry section of trail coming up (who would have thought Oregon would be so dry?) but that I could stop at Hyatt Lake resort, about 1.4 miles off trail, where I could get a shower. Since I had just showered a couple of days ago, and couldn’t eat real food, I had no desire to hike off trail. He did say there was a pump after the resort. 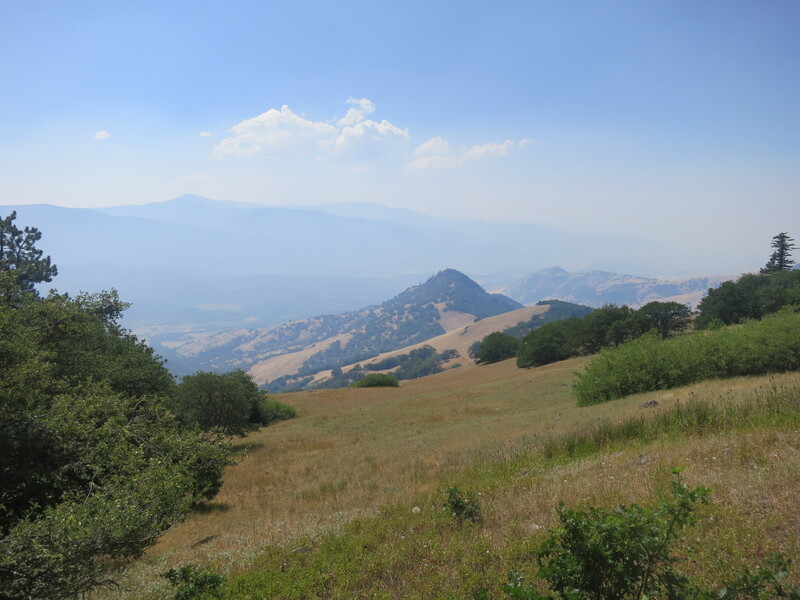 Ever since I reached the half-way point of the trail, and especially with less than 1,000 miles remaining, I kept my mind occupied by trying to remember where I was and what was happening to me at that same mile into my hike. I was surprised at how much I could remember. In the late afternoon, I was surprised to reach a bridge spanning a wide, fast-flowing creek! Forrest had not mentioned this as a water source! I was a little perplexed, but happy to be able to replenish my water and make myself an ice coffee! As I sat on the edge of the bridge, Track Meat came along and told me his version of the night’s happening at the dance club and their scary ride back to the trail with a man who was high and who decided to follow them back to their campsite. Without a headlamp, and in the state he was in, he kept stumbling, losing the trail, and shouting out for help. He kept the guys up with his talking until they told them they didn’t mean to be rude, but that they needed to get some sleep. Track Meat took out an entire package of Newman’s mint oreo cookies and offered me one. It was such a treat with my ice coffee! He, too, was surprised about this river. “The southbounder failed to mention this raging river!” I said. As I sat there snacking, a mother, daughter, and their dog came off a side trail and then picked some blackberries nearby. Soon, Ole came along. I got to hear the same story from his perspective, which was amusing. He had been having a tough time staying awake as he walked today and I asked him why he couldn’t just lie down and take a nap. He wanted to keep up with Veggie. He was also stopped by Forrest and had to excuse himself when he couldn’t keep his eyes open anymore. He headed on as I finished my break. I crossed the road leading to the Hyatt Resort and as I was about to reenter the woods, I looked back at the road as a car turned off. I recognized the shirt on the arm hanging out the window as that of Beer. Hmmm… It had been quite apparent to me that he and Ranch had been hitchhiking and skipping parts of the trail, but now I knew for sure. I came upon the faucet and the multitude of bees swarming around it and topped off my water supply before heading back out. It was now late in the day and I was growing tired. I took frequent pack breaks and tried to muster up all of my remaining energy. Eventually, I came out to a flat area with an intersection of dirt roads. I wasn’t sure where the trail was. There were several fire rings around, but the area was too eerie to camp in. I walked by a tree with a no camping sign and was amused to see a fire ring right beside it! 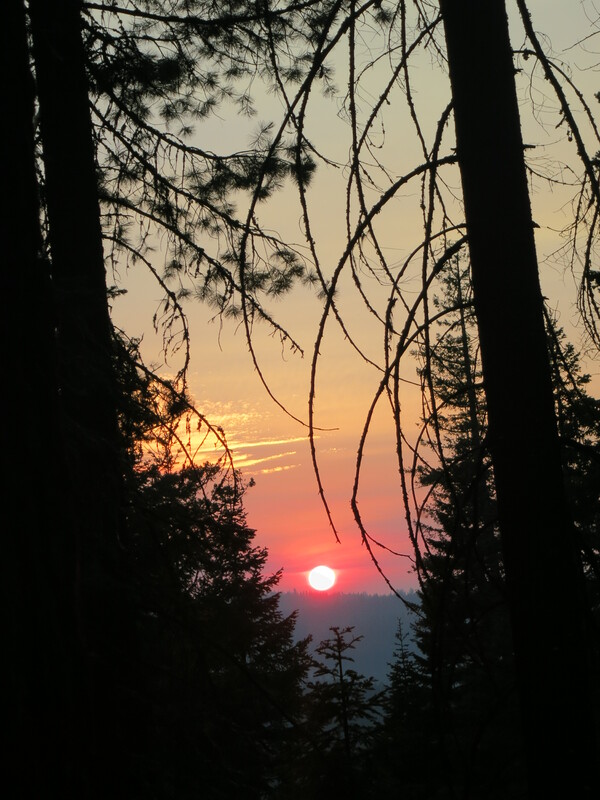 I found the trail as it lead back into the forest and caught a glimpse of the huge orb of red sun sinking through the trees. 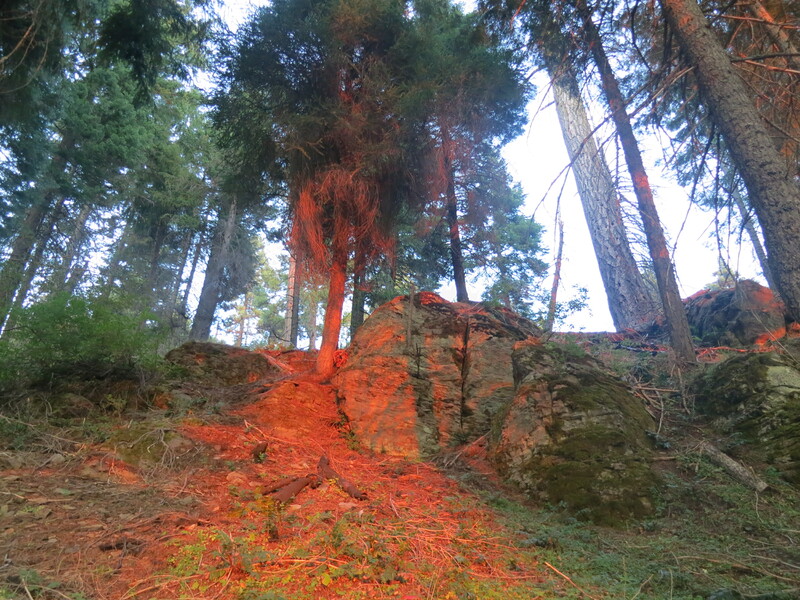 It was casting a magnificent shade of color on a section of trees on the other side of the trail. 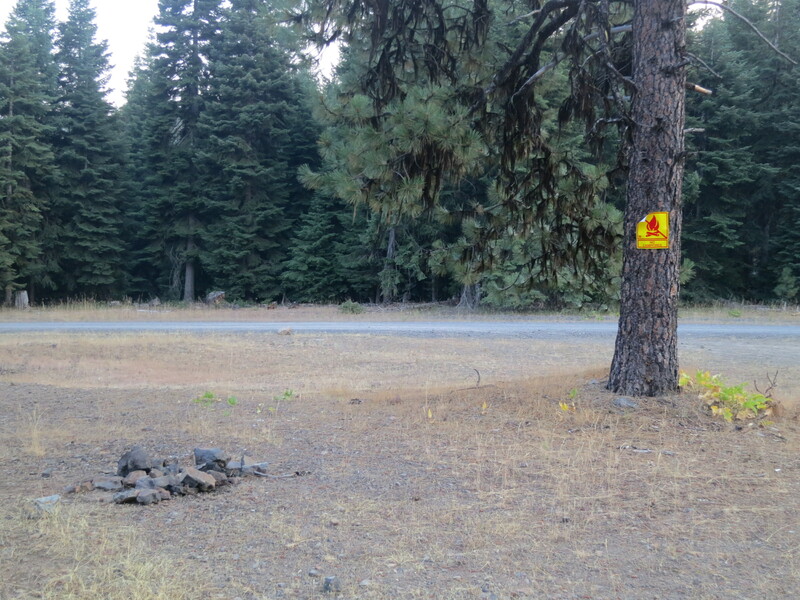 Before long, I spotted an area off to the side of the trail that was suitable to stop at, even though I was surrounded by charred chunks of trees. I set up my cowboy camp and cooked dinner and then watched a man hike south along the trail into the darkening night. I felt slightly vulnerable. Fortunately, he offered a slight wave and kept walking. 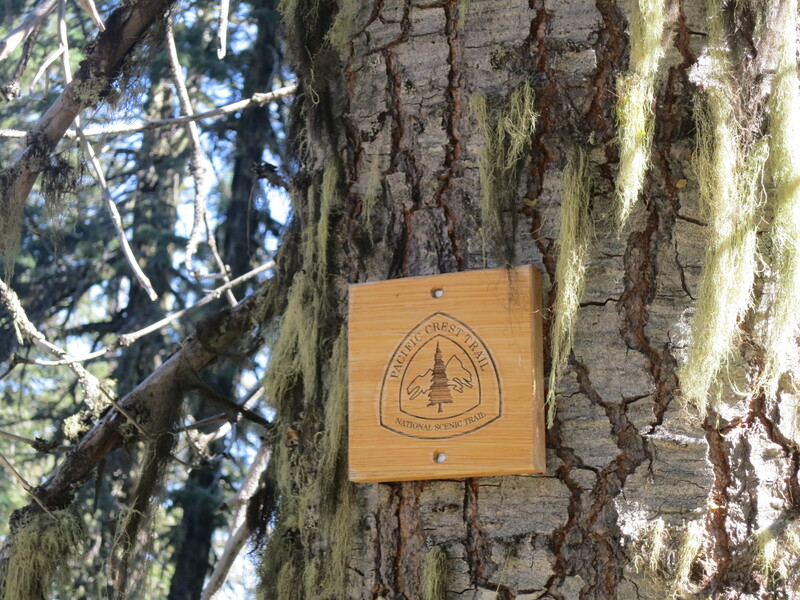 This entry was posted in Uncategorized and tagged Oregon, Pacific Crest Trail, PCT, PCT 2013 blog, thru-hiking by Wendy. Bookmark the permalink.